The jointly-owned launch service provider International Launch Services (ILS) is poised to send the Turksat 4A communications satellite orbit on Valentine’s Day, Friday, February 14. 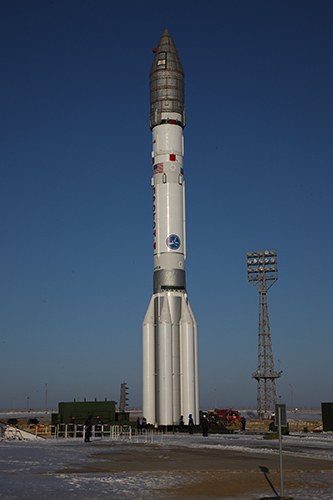 ILS will launch the commercial spacecraft atop a Proton Briz-M rocket at 4:09 p.m. EST (2109 GMT) from Baikonur Cosmodrone located in Kazakhstan. This will be the first time that Turksat Satellite Communication and Cable TV Operation AS (Turksat AS) has selected ILS to launch one of their spacecraft. The launch vehicle and spacecraft were integrated at the Integration-and-Test Facility 92A-50. When these tasks were completed the “stack” was moved to what is known as the fueling shed on Feb. 9 where the Proton’s low-pressure tanks were filled with propellants. Having completed all of these milestones, the rocket and its precious cargo were rolled out to the launch pad yesterday morning. Final launch approval is still pending the State Review Board’s decision. 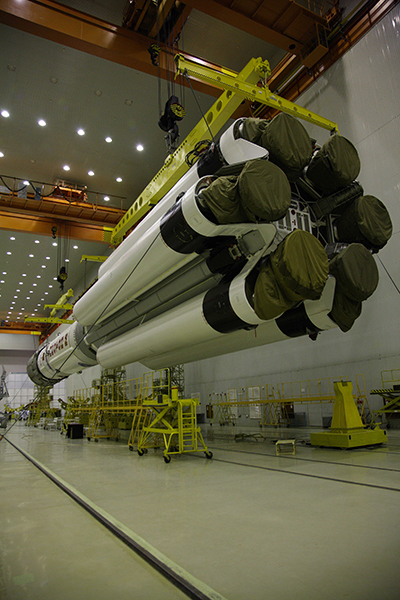 Friday’s launch will mark the first of two planned launches for Turksat this year (the second, Turksat 4B, is planned to be launched in June of this year). The slip of the launch date for Turksat 4A from a planned November 2013 launch date until the Feb. 14 launch date could be due to a severe accident which saw the loss of another Proton Briz-M launch vehicle and the GLONASS navigation satellites it was carrying in July of last year. 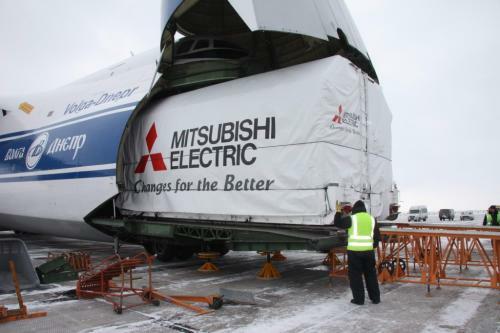 Both Turksat 4A and 4B were constructed by Mitsubishi Electric (MELCO) which was awarded the contract in March of 2011. The satellites were supposed to be launched in the fourth quarter of 2013 and the first quarter of 2014, respectively. Each of the Turksat 4 satellites are designed to last for about 15 years and provide telecommunication and direct TV broadcasting services throughout Turkey, as well as in Europe, Central Asia, and Africa. Turksat 4a will be placed at 42 degrees east longitude and its sister 4B spacecraft will be at 50 degrees east longitude. The two Turksat satellites provide services in the Ku-band as well as C- and Ka-band communications channels. Turksat 4A will have 28 Ku band and two Ka band transponders. The amount of C band transponders on board has not been released. Turksat weighs in a mass of about 10, 800 lbs (4,900 kg), well inside the lifting capacity of the Proton Briz-M 49,000 lbs (22,000 kilograms) with a geostationary lifting capability of 14,800 lbs (6,700 kilograms). MELCO utilized the Mitsubishi Electric’s DS2000 satellite bus platform, a proven design which should be able to handle the diverse array of payload applications. Turksat 4A will be the ninth spacecraft built using this design. The MELCO website states that the company has participated on more than 440 domestic and international satellites as prime contractor and major subcontractor. Max-Q is where the rocket’s speed coupled with the density of the atmosphere conspire to place the launch vehicle under the greatest amount of stress during ascent. After about two minutes staging, the point where the spent first stage is jettisoned, will take place. The first stage, now empty of fuel will be left to crash into the deserted steppes of Kazakhstan. Each Proton stands an impressive 174 feet (53 meters) tall and was initially developed to heave 100 megaton nuclear warheads more than 8,000 miles (13,000 kilometers). During the competitive days of the early Space Age, Vladimir Chelomei’s engineers developed the booster as a counter to Sergei Korolev’s massive N-1 booster. 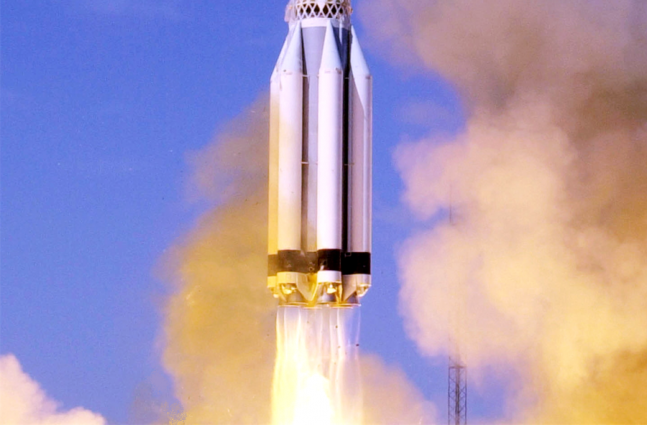 The Proton has a long and storied history with one of the launch vehicle’s being used to heft the first segment of the International Space Station into orbit back in 1998.